I’ve been very impressed with accessory manufacturer Vinpok, which keeps coming out with surprisingly good and inexpensive goods like the recent Taptek Mechanical Keyboard. The company uses crowdfunding to get products launched into manufacturing, and currently has 24 days left on a very successful Indiegogo campaign. This time, the company is touting the Vinpok Split, a very portable touchscreen monitor that can be attached to many devices through a USB Type-C mini HDMI connection. 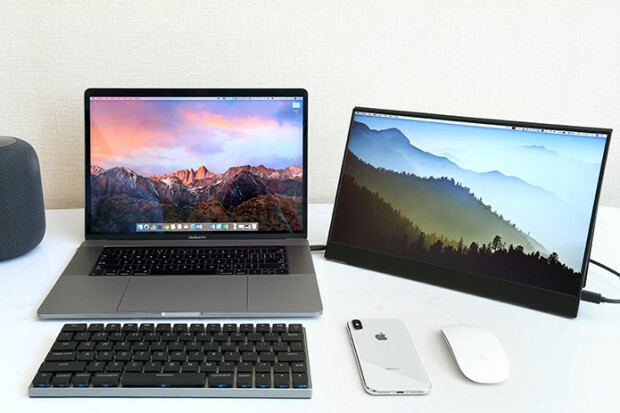 The screen is perfect for turning your MacBook into a multi-screen workstation. Two Splits can be attached to a MacBook Pro for a wide three-screen workstation. The screens have 1080p resolution with a diagonal size of 15.6 inches (396.24mm), and weigh only 1.4 lbs. (0.64kg). For those who have USB-C based Android phones, it’s even possible to connect a Split monitor to turn it into a large touchscreen workstation. Gamers will be happy to know that they can plug in a gaming console (PS4, NS and Xbox among others), for on-the-go fun. The company sells a special clip that looks suspiciously like the Ten-One Mountie for attaching the Split to a laptop, as you can see in the video above. The company has already started production of the Vinpok Split, and is expected to ship in December. Apple World Today will feature a full review of the Vinpok Split soon.